I will never use store-bought strawberry sauce again. We are in our last full week of summer vacation and suddenly I’m trying to cram a whole summer’s worth of fun into a few short days! 🙂 We’ve had an overnight family campout, birthday parties, a trip to the water park, play dates with cousins at the park and extra goodies for dessert every once in a while. The kids are in for a rude awakening when school starts back up next week. 🙂 Last night I made these sundaes created by Chef Antonia Lofaso after dinner. What says “summer” more than an ice cream sundae made with fresh fruit? To make blueberry whipped cream either by hand or with a stand mixer fitted with a whisk attachment, whisk cream, crushed blueberries and confectioners sugar until soft peaks have formed, about 5 minutes by hand and about 3 minutes with stand mixer. In an 8-inch sauté pan, combine water and granulated sugar with strawberries and cook on medium to high heat for about 5 to 6 minutes, until water and sugar create a syrup and strawberries begin to slightly breakdown. To make each sundae, spoon the warm sautéed strawberries onto the bottom of a small bowl. 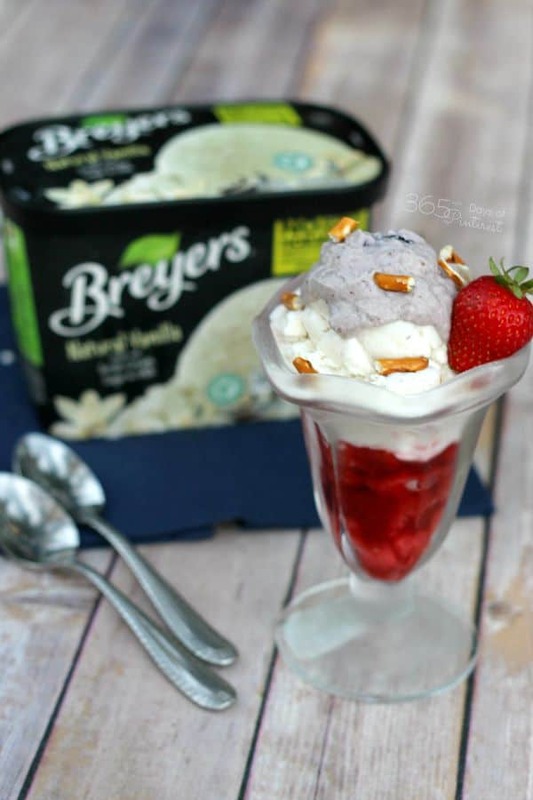 Top with ½ cup scoop of Breyers® Natural Vanilla Ice Cream. Add a small dollop of blueberry whipped cream and sprinkle with pretzels. Breyers is now sourcing their milk and cream from cows not treated with artificial growth hormones* and the vanilla is real and from sustainably farmed vanilla beans. Little things like that take what might be considered a “boring” vanilla sundae and elevate it to a creamy, flavorful that you can feel good about serving to your family. The pretzels may seem like an odd afterthought, but they really add a lot to the sundae! It’s that nice combination of salty and sweet that is so popular (french fries and ice cream, anyone?) They also hold up well and stay crunchy so the texture is great. Go ahead, give them a chance! If you are looking to save some calories, skip the whipped cream and pretzels and go with a few fresh blueberries on top instead. 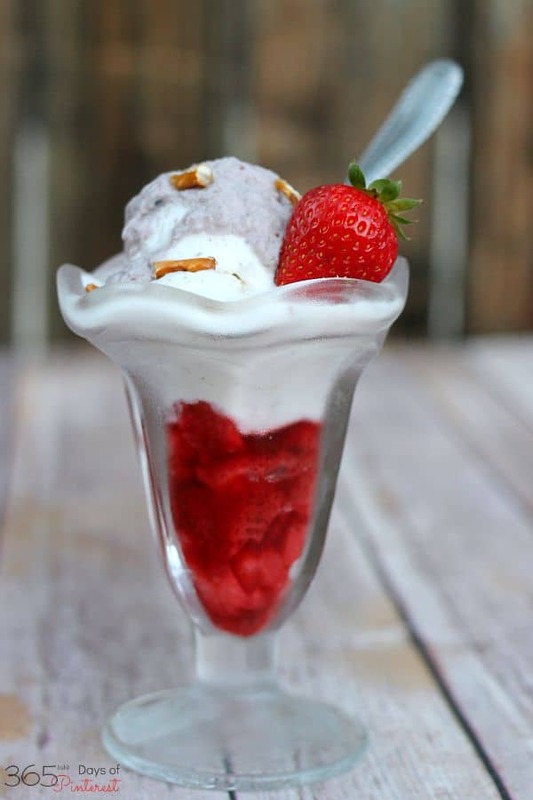 Just DON’T skip the strawberry syrup because that is definitely the best part of this stars and stripes sundae! 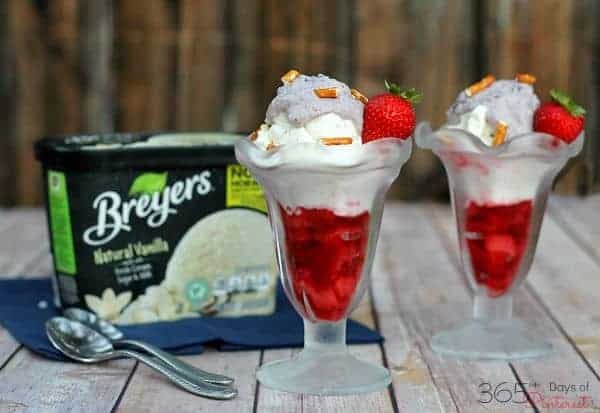 For more great recipes using Breyers ice cream, find them on social media and then grab a carton at your local grocery store-they are available nationwide! *Disclaimer: Suppliers of other ingredients such as cookies, candies & sauces may not be able to make this pledge. 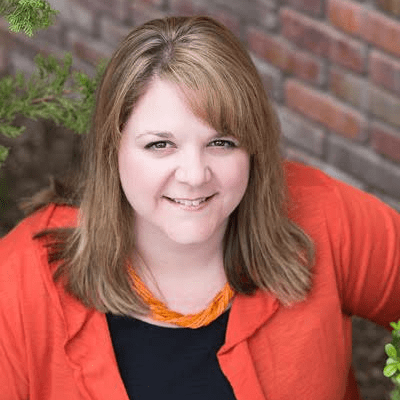 The FDA states that no significant difference has been shown between dairy derived from rBST-treated and non-rBST-treated cows. I love the name of this sundae! I’m such a berry fanatic, this is right up my alley! This is a very delicious looking Sundae. And now I’m heading to the freezer for my Breyer’s to make a sundae! This looks perfect for the hot summer days we’ve been having! I love Breyer’s ice cream!